I shall spoil nothing for you. 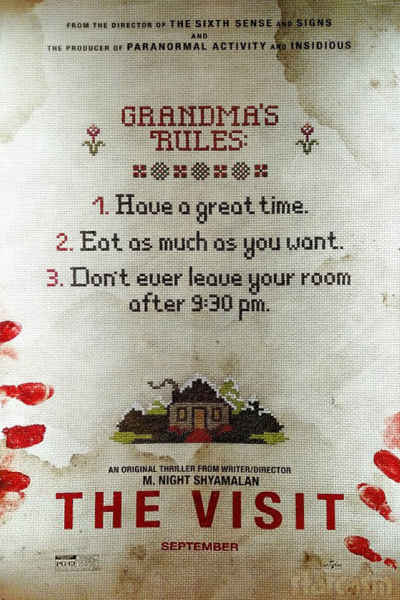 As for whether one should bother seeing The Visit or not, meh. It's a 5 or a 6, more Signs or The Happening caliber than Unbreakable or The Village, much less The Sixth Sense. Shyamalan reaches and reaches and reaches, though, doesn't he? I do love that about him. A fighter in the ring, going round after round. In general, that's good enough and, when he does connect, it's a glorious thing to behold. An Oscar winning thing. I'll keep showing up, knowing that one day, perhaps right around the bend, he will indeed connect again. In the meantime, I'll enjoy his B's and B+'s, knowing most directors would kill for 'em.